IT’S ELECTRIC⚡! 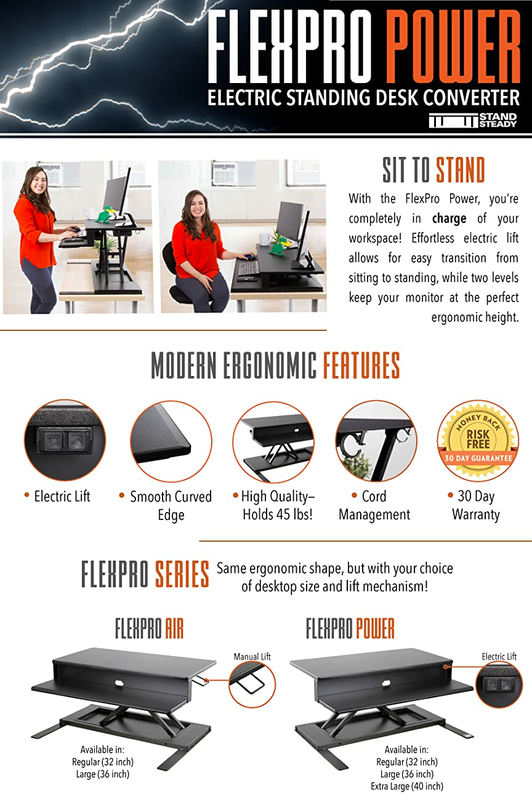 Introducing our most convenient standing desk converter – the FlexPro Power 32" Sit Stand Electric Desk Converter! Can you handle this kind of power? Of course you can...because it raises and lowers with the push of a button. *Older version shown in video - Up to date version in photos! POWER LIFT: Effortlessly transition from sitting to standing in seconds! This adjustable desk riser includes a powerful electric motor for push button adjustment. EXTRA TALL: Do people ask you "how's the weather up there"? No problem! Stand Steady’s FlexPro Power can reach for the stars. The Top shelf will rise up to 19” above the desktop! When used with a typical office desk – this will accommodate practically anyone up to 6’2”! SPLIT LEVEL SURFACE: Places your keyboard and monitors at the right heights relative to each other. That way you enjoy strain free typing and viewing whether sitting or standing. Our 32" version offers plenty of width for dual monitors while maintaining a small footprint. STURDY & SLEEK: An adjustable height desk you can trust! Its strong base can hold up to 45 lbs.! Sturdy enough to hold your 2 monitors, or your beloved iMac, and all of your favorite accessories. USER FRIENDLY: Cord pass through holes help keep cables tidy while a magnetic panel behind the keyboard tray offers a spot to place notes and photos. FULLY ASSEMBLED: We’re here to make things easier for you – so it’s already assembled with love and care. Just open the box, plug it in, and STAND. Look no further – you’ve found your standing solution! One month in - so far so good. One month in - so far so good. Feels and looks as quality item. Electric mechanism works well and is convenient. I just hope it is reliable. Like the push of a button to raise up and to lower. My PT recommended I get a standing desk as I was sitting too much during the day after having total knee replacement. This desk has provided the perfect solution. Would highly recommend. And the installation was simple: take it out of the box, plug it in and go. After researching various standing desks, I decided to get one with the electric button for raising/lowering. I chose this one from Stand Steady because of the reviews it had received and the cost was affordable. I have been using this one for approximately a month now and love it! My back has certainly felt better since standing vs. sitting most of the day. Construction seems to be solid, came installed (just a little heavy) and easy to use. Electric motor is very smooth. Raise it with monitor and laptop on top with no issues. Great product! Love this! Extremely sturdy, sleek and functional! Why buy a manual one?? My employer purchased the 32 inch version for me and I used it for the first time today. It is very sturdy and goes up and down smoothly. Love that it's electric because I would imagine that manually lifting it up every time I want to stand would be a back-breaker. The only problem we had with set-up was installing the power cord. It is in a very hard-to-reach location and all I know is that the solution involved a long knife handle! Otherwise, at this point I would have given it 5 stars. Now everyone in the office wants one. Seems like a great value.